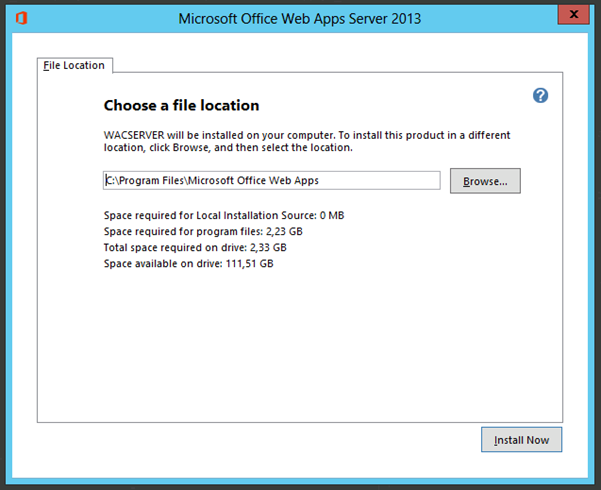 An additional application next to Exchange Server 2013 is a new server product called Office Web Apps 2013. The Office Web Apps server can be used to render Microsoft Word, Excel and Powerpoint file types. Other than this the Office Web Apps server is used by Exchange Server 2013 to provide the Web Ready Document Viewing, something that was made available by Exchange Server 2010 natively (although a non-Microsoft engine was used to achieve this). 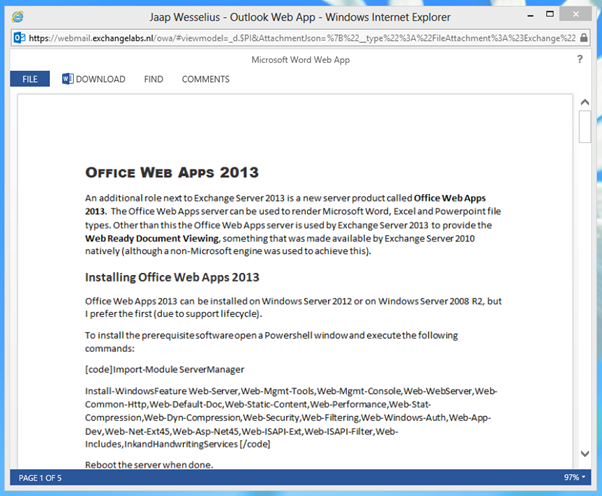 Office Web Apps 2013 can be installed on Windows Server 2012 or on Windows Server 2008 R2, but I prefer the first (due to support lifecycle). 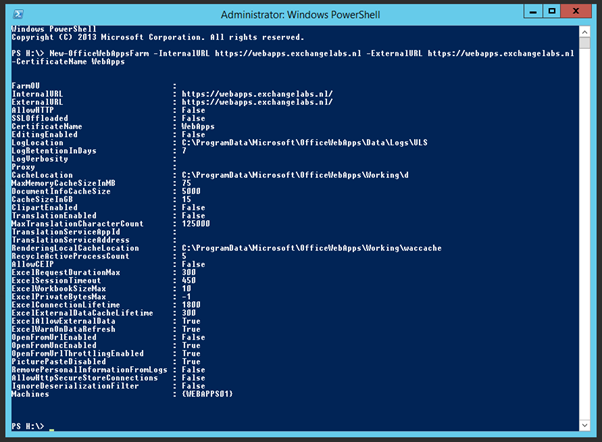 If you plan to use the latter make sure that you install the .NET Framework 4.5 and Powershell 3.0, these are installed by default on Windows Server 2012. Web clients use SSL to securely communicatie with the Office Web Apps server so a (3rd party) certificate needs to be used. 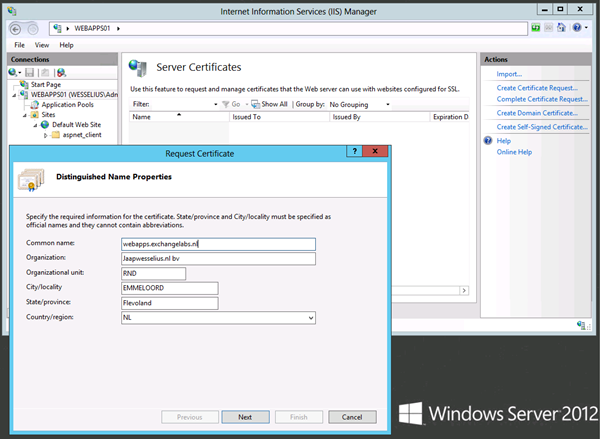 To request an SSL certificate, logon the the Office Web Apps server and open the IIS Manager. Select the server and in the results pane (i.e. middle pane) double click Server Certificates. In the Actions Pane select Create Certificate Request to create a new request (.req) file. Once the certificate is returned from the Certification Authority select Complete Pending Request to import the .CER file. When performing this step there’s the option to enter a Friendly Name, something that’s used later on in the process. My Office Web Apps 2013 server has a direct Internet connection with a dedicated public IP address so I don’t have to worry about publishing. Maybe I will write something in the (near) future about publishing using a load balancer or using TMG2010. 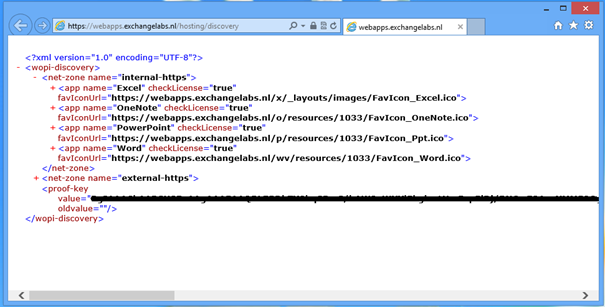 Your browser will use this URL to discover the Office Web Apps configuration. 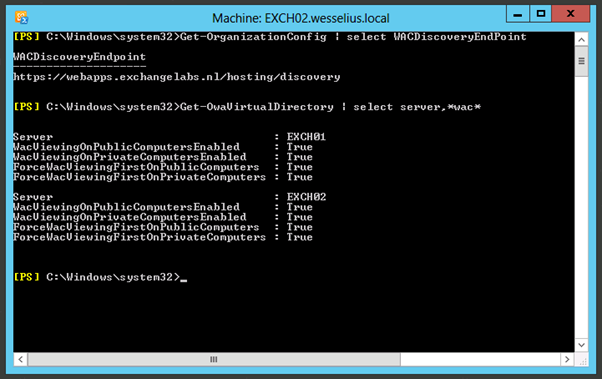 The last step is to configure Exchange Server 2013 to use the new Office Web Apps server. This is configured on an organization level and on the OWA Virtual Directory level. Note: WAC is an abbreviation for Web Access Companion.